The mice teeth are barely visible through the glass vial pulled from a drawer by paleontologist Shane Tucker. These are no ordinary incisors. The white specks belonged to a rodent that lived 20 million to 23 million years ago. Dozens of similar vials -- all filled with mice teeth -- are housed in cabinets on the fourth floor of Nebraska Hall, home to a big chunk of the University of Nebraska State Museum's vast fossil collection. The teeth and thousands of other fossils -- some the size of mastodon bones -- were collected over the past 50 years by paleontologists and their assistants working for the University of Nebraska State Museum and the Nebraska Department of Roads. Their work is being celebrated in a new exhibit at Morrill Hall called "Highway Paleontology: Life in the Past Lane." The fossils were found by road crews building highways and painstakingly dug out with trowels, picks and brushes like long lost buried treasure. "Nebraska is one of the richest places for fossils," Tucker said. "Any time they break ground, there's a good chance you're going to recover fossils." Still, less than 1 percent of highway projects produce fossils. 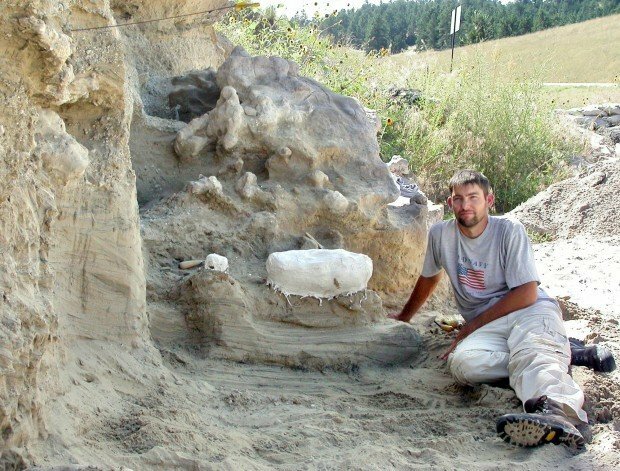 Tucker joined the highway paleontology program in 1999 and has criss-crossed the state, salvaging fossils before road crews lay down concrete and asphalt. His goal, and the goal of his predecessors, including Bruce Bailey and George Corner, has been to save and preserve the state's fossil record for future generations to study. Tucker estimates they've saved more than 200,000 specimens over the past five decades, including the remains of a camel, rhinoceros, long-jawed elephant, giant land tortoise and a plesiosaur, a sea lizard that last swam in the oceans 65 million years ago. "If you go to any museum in the U.S. there's a pretty good chance you will find fossils from Nebraska," he said. One of the best finds was in the Wildcat Hills south of Gering in 1968. The realignment of Nebraska 71 exposed a 20 million- to 23 million-year-old river channel. Paleontologists found a few fossils during construction and revisited the road cuts for the next 30 years. 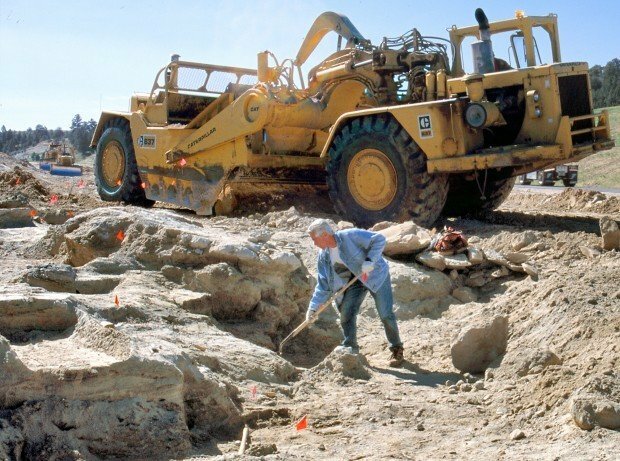 Then, in 1999, road crews dug deeper into the channel as part of the Heartland Expressway project and paleontologists hit pay dirt. Over a six-week period, they collected about 600 bones, a third of which were skulls and jaws. Among the 60 species recovered were turtles, snakes, birds and mammals, and a new species of beaver and gopher, a hippo-like creature, three species of three-toed horses, a couple of different camels and the sternum of a 6-foot-tall, flightless bird. In 2005, Tucker discovered a "super rare" fossil in the Wildcat Hills: a complete skull of a sling-shot horned deer, which is on display at Morrill Hall. Excavations don't interfere with construction, Tucker said. Road crews work around a dig and then go back to finish the project. "It is hard to fathom the amount of information that would be lost if this program didn't exist," he said. Closer to home, near Humboldt, paleontologists found the state's oldest vertebrate land fossil: a tiny, 290 million-year-old lungfish. Mice, rabbit and peccary fossils also have been found near Ashland. "We are very proud of our cooperative relationship with the University of Nebraska and the university's State Museum on our highway salvage paleontology program," Roads Department Director Monty Fredrickson said in a news release. "For the last 50 years, the Roads Department has carried on its mission while sharing its work sites with the university, its students and its experts, for scientific exploration and study." Federal and state legislation paved the way for creation of the highway paleontology program in 1960. Tucker said it was the first of its kind in the nation. "Most states contract out the work with environmental consulting groups on a project-by-project basis," he said. Most of Tucker's fossil digs are on state rights of way, but he'll dig up fossils found on private land if landowners agree to donate them to the museum. Fossilized horse skeletons have been found in excavations for basements. Tucker, 35, and his assistant, Nick Famosa, spend a big part of their summers investigating fossil dig sites. Except in bad weather, they camp in tents and cook their own meals. They operate on an annual budget of less than $150,000. Tucker said it's a great job -- they're out on their own and visit some of the most scenic areas of Nebraska. "It is, but it's a lot of hard work," he said, adding that they often spend 12 to 15 hours a day on the job, and they don't get overtime. Last year, Tucker was on the road for 150 days. And on some of those days, he came back with 30-pound bags of gravel that contained mice teeth. Reach Algis J. Laukaitis at 402-473-7243 or alaukaitis@journalstar.com.